Much of Tacoma, Washington is built on a hill overlooking beautiful Puget Sound. While the view is spectacular, Tacoma averages more than 37 inches of rain a year, creating a surface and subsurface water challenge for the business district below. 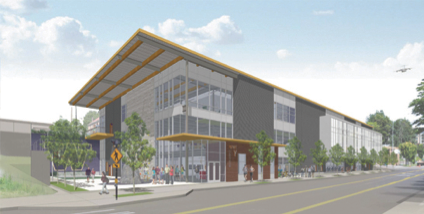 During construction planning, Mortensen and University of Washington-Tacoma Facilities teams addressed the challenge by installing pumps that move up to 4,000 gallons of water from the building footprint daily. 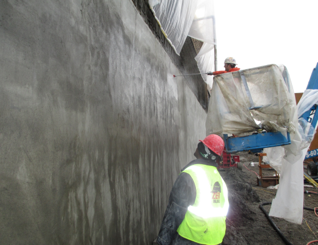 A 6800 square foot shotcrete wall system was also constructed to protect the new structure from the water run-off. 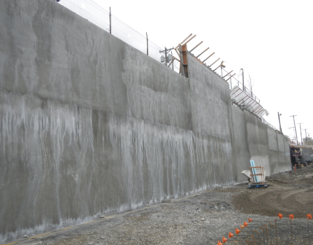 The construction team included Spray-Lock Concrete Protection® (SCP) Technology as an integral part of their solution to prevent moisture intrusion into the building from the hill. After Spray-Lock application, tests showed that SCP 327 penetrated over 7.5 inches into the 9-inch thick wall, reducing potential for moisture issues, efflorescence, and shrinkage cracking. Thirty days later, there was no shrinkage cracking and no evidence of moisture or water intrusion through the wall. Because of these proven sustainability benefits of Spray-Lock’s Concrete Protection® Technology, SCP will be used in additional walls and the Student Center slab as construction continues. The Student Center is expected to open in January 2015.